Backup folder every time when you need to feel this particular folder content to be secured! With a convenient and reliable Handy Backup solution, you can feel protected when making automatic folder backup to any place, regardless of an exact folder location and its content type! For these folders, typically containing up to 90% of principal content for Windows backup folder operations, Handy Backup provides dedicated plug-ins, definitely named "User Folders" and "Windows Libraries", allowing quick access and fast backup or recovery for these folders or separate files inside. As a folder backup tool, Handy Backup contains not only the "Computer" plug-in that allows making auto backup folder data but also a searching engine called "File filters…" on the Step 2 of a new task wizard. Using file filters, you can include or exclude data in your backup folder list by a mask of name. Some folders are big and containing constantly changing data; therefore, an external disk is a perfect place to save this content. You can backup folder to external USB drive automatically by triggering a backup task to run every time when you will insert a task-related USB device to some USB slot in a PC. The Standard edition for home users is a full-scale folder backup software solution, allowing saving folder copies locally, by a network or to any popular cloud. How to Make Automatic Folder Backup? 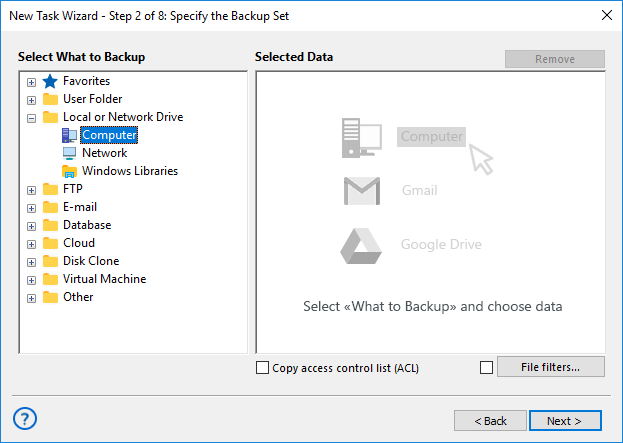 Select a backup task type on the Step 1. Click "Next" to proceed. On the Step 2, open the "Local of Network Drive" group and select the "Computer" plug-in. In the data selection dialog find a folder that you want to back up. Mark a checkbox against the folder name. To back up another folder, mark it, too. Click OK and return to the Step 2 window. Continue creating a task (see the User Manual for details). That is all! With Handy Backup, you can create tasks of auto backup folder to many different places: other local folders, USB disks, NAS units and network drives, FTP, SFTP and FTPS servers, and cloud storage accounts including S3 cloud servers, OneDrive, Dropbox, Google Drive backup or WebDAV-based services. 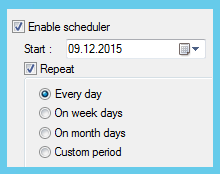 Schedule your tasks to run at an exact time and with a precisely defined interval of repeat, from minutes to months, or start to backup folder content by a system event. Additionally, you can run other software before or after executing an auto backup folder task. The last but not least is a set of options for making file folder backup safer and less consuming. These options include partial (incremental, differential or mixed) backup, making many versions of a single folder copy, built-in encryption and compression, and many other functions of folder backup software. 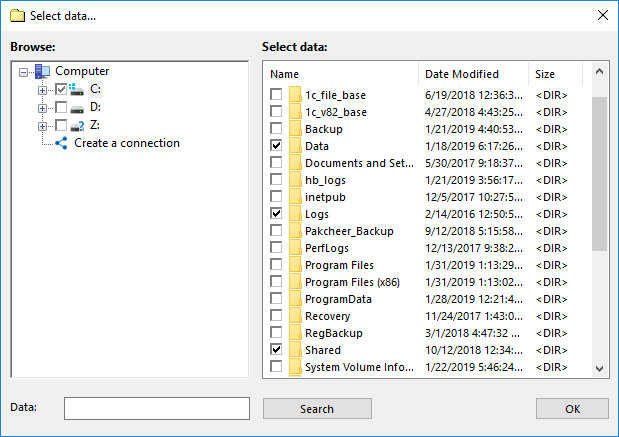 Handy Backup can backup folders in Windows 10, Windows 7 or any other modern version of Windows, including server editions (such as Windows Server 2016). It also supports Linux in native mode, allowing to backup folder content under Ubuntu 16.04, 14.04 or compatible distributives. 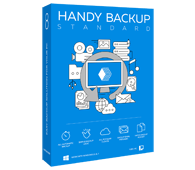 Try Handy Backup as your standard software to backup folders automatically! Download a fresh version with all plug-ins now for a free 30-day trial!